Taggify is new entrant in online advertising world.I created account with Taggify in year 2011.It was in beta stage at that time.Now it has come out of beta stage.In year 2011 it received StartUp Chile grant. The start-up grant did lifted Taggify.It has now offices in Argentine,Chile and USA as per their website. 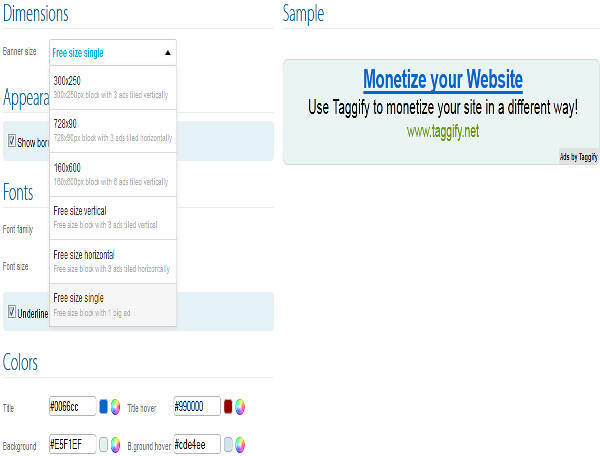 In this post I will write detailed review of Taggify based on my experience with them.Google Adsense being leading money making program I did not run Taggify for long.But in case you do not have Adsense account then it is worth trying Taggify. Taggify does not impose strict traffic requirement.So it is easy for new websites to get approved.But they do not accept adult content and violent content.The signup process is simple and fast.I signed up long back.So I am unable to recall the exact time taken.But it does approve sites instantly. You can sign up for Taggify using this link . Taggify provides wide range of products to make money from your website content.Not too many advertising networks provide as many solutions as it.It offers products to make money from your images,videos,external links and text. I am discussing each product in detail so that you can have idea of ads type. Using Taggify control panel you can customize look and feel of your In Image ads.You can also select all three of above ad formats or any one of them using control panel.In above image you can see In bar ads format. 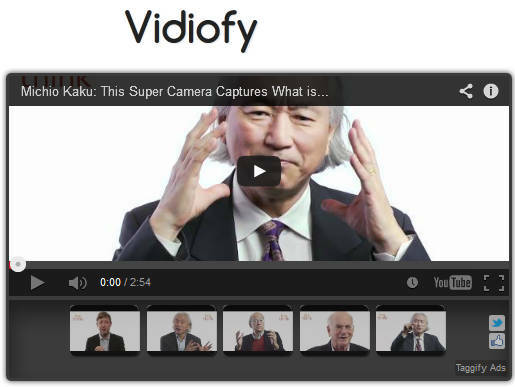 Vidiofy helps you make money from your videos.It displays ads within your videos (In Video ads). Currently it does not work if you have placed video using HTML5 video tag on your website.It will show no ads in that case.I tested this on this very site. I am using HTML5 video tag to place videos on my site.Taggify shows no ads in those videos.But it works if you have embedded videos from YouTube or other sources.They do not provide any customization option for Vidiofy. Linkify is used to make money from visitors leaving your site using external links on your website.Lets assume that you have an external link on your webpage.Normally if a visitor clicks on it he/she is directed to external website.But if you turn on linkify then visitor will see a full page ad before being redirected to external site. So you can earn money from visitors leaving your website through external links on your website.However Linkify does show only one add per visitor.You can also turn Linkify for internal links as well.But I will not suggest turning it on for internal links.It is not good visitor experience. Textify is intext ads from Taggify. They do not underline the keyword like Infolinks or double line the keywords like Kontera.They highlight the keyword.You can customize Intext ads like color and number of keywords to highlight. Ads will display when visitor hovers mouse over that highlighted keyword.In above image you can see the displayed ad and highlighted keyword. 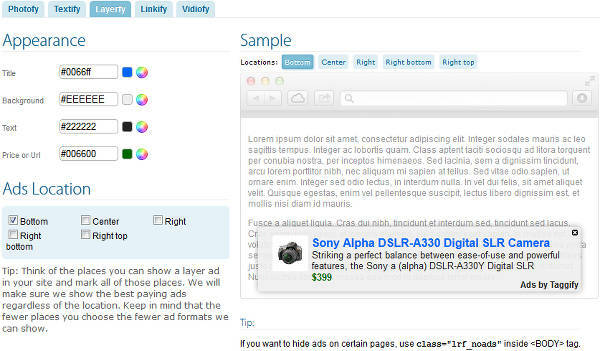 Layerfy displays banner ads on top of your page.You can select position in which the ad will be displayed.It floats above your page.Below image shows layerfy ads.I have configured it to display on bottom of page.You can select the position according to your requirement. It is better to choose bottom or right bottom (more preferably) position for these type of ads.Placing on these positions maintain visitor experience.Visitors do not have to close the ad to view your content. Free size vertical,Free size horizontal and Free size single are responsive ad units.Free size vertical fills up empty space in vertical direction with ads.Free size horizontal occupies all space in horizontal direction and displays ads.Free size single displays a single ad and fills both horizontal and vertical direction. According to Taggify all products are compatible with Google Adsense.This seems to be true and nature of products offered by Taggify are different than that of Google Adsense.I have tried all Taggify products on this site except the banner ads and linkify along with Google Adsense without any issue. The minimum payment threshold is $100.I think it is too high for new advertisement network.They should think of lowering this to $25 or $10 to start with.Recently new advertising network are lowering their minimum payment threshold to $1 also.Yllix is one example.Low minimum threshold works good for publishers with new website with low traffic. The payment method is PayPal and Payzaa.Payment is made after 30 days once your account balance is equal or more than $100 before 5th of next month.They can also consider adding more payment modes as well. 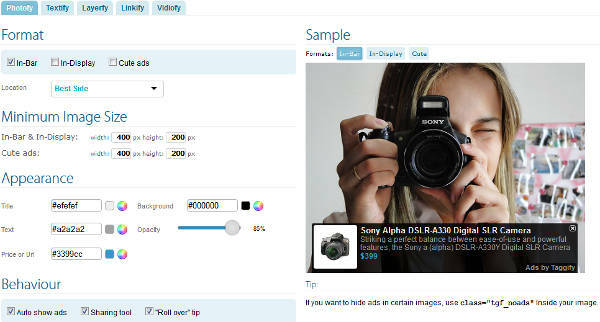 The publisher dashboard has simple interface.You can easily select or deselect products to use.You can also customize the look and feel of the products individually.Ad code for all the products can be generated using a single interface.Only for banner ad code you have to use different interface.But considering the nature of ad code and difference with other products this is understandable. The reporting is also detailed.It displays page views,ad views,clicks,eCPM and other fields as well.It displays graphical as well as tabular report.You can view Channel wise reports as well.You can see data from last year,last month,last 6 months,last 3 months and 2 weeks as well. You can also filter reports according to different products mentioned above.This gives you idea of products working for your website.You also get idea of products with good eCPM and products without decent eCPM. Initially Taggify did not offer any referral program.Recently they have come up with referral program.You can earn 10% of your referral earning for lifetime.The referral terms looks good.So if Taggify becomes big then you have chance of earning huge. Taggify ad code loads fast.A single ad code is used for all products except Banner ads.The page load time is not impacted to great deal.Since speed has become an important factor fast loading ad code is important.You can use Taggify along with other advertising networks without hampering your website speed. Technology wise Taggify is advanced than most of advertising networks out there.The myriad of products and responsive ad unit does strengthen previous statement.But it is yet to see if it attracts advertisers and prove good companion and alternative to Google Adsense. Have you tried Taggify? Share your experience.